You can quickly find everything you need at our informative and secure store. Call one of our friendly team during office hours…or leave a message. Simply search for Sticky Kids at either i-tunes or Amazon and download the songs you want, or entire collections (remember you won’t get the user notes and printed lyrics this way). resource that you’ll ever need. Not only are the songs tried and tested over 25 years, but they never go out of date - you’ll be able to use them year after year, with generations of children. Our CDs form a comprehensive learning resource for early years and will help you achieve the goals for physical education set out by Early Years curriculum requirements, including the ABC of learning - A for Action, B for Balance and C for Co-ordination - as well as language skills, listening skills, days of the week and much more. 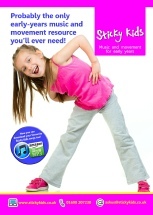 Our Fun and Fitness CDs come with a companion booklet which explains clearly how each song can help your children exercise while they have fun. Let’s all go for gold together! Watch Molly Muddle show you how to wiggle and jiggle along to a favourite Sticky Kids song. There are lots more of these clips to come - be sure to subscribe to our You Tube channel here!